Lately I feel like I've been going through a bit of a struggle. 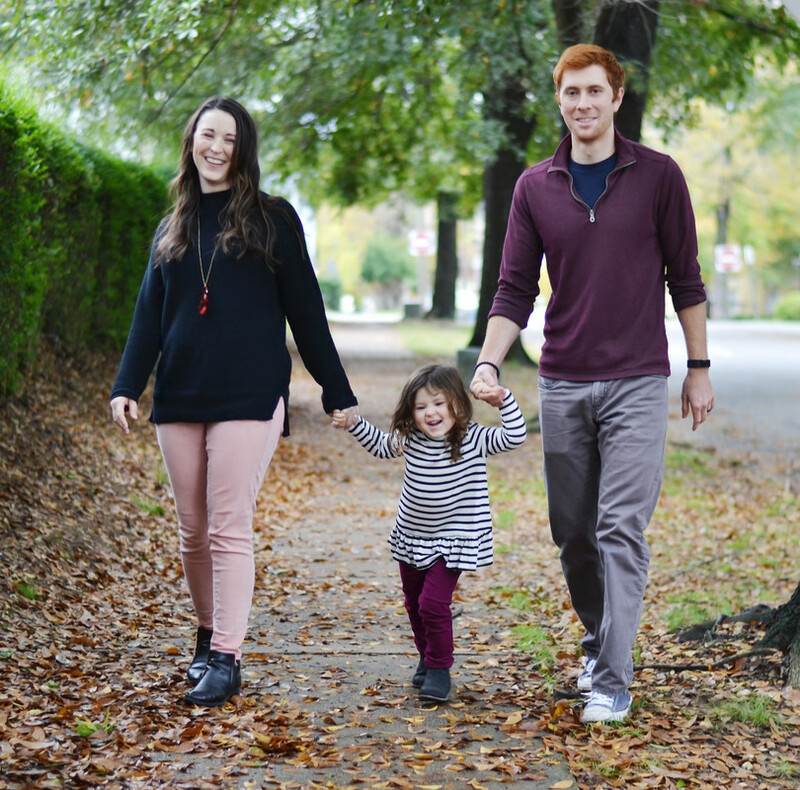 This struggle is ever present -- both on the blog, and outside of it. I feel like I am in a constant battle to be original. You see, we are all so well connected these days. We share pinboards. And blogs. And Facebook posts with specials going on at our favorite boutiques. One day, I woke up and realized that everyone was wearing the same thing. Our homes were decorated the same way. We used the same lingo and we laughed at the same things. We hit the same sales, bought the same products, and read the same magazines. Everyone wore the same hipster glasses, threw on the same infinity scarf, and we all toted around the same hot beverages in the same disposable mugs. We idolized the same celebrities and watched the same TV shows and vegged on the same movies. Suddenly, everyone wasn't comprised of "every one" but of just a group of "one" -- all the same. No originality. Honestly, that frightens me a bit. You see, I've always thought that I found beauty in the unique... the original. When I was younger, I noticed that I had three giant freckles/moles framing my face in an "L" shape. Although I didn't love my freckles at the time, the discovery felt original and made me smile. I vividly remember staring in the mirror and thinking to myself, "I bet there is no one else in the world with these exact three freckles. I'm one of a kind." Sometimes, I click around between blogs and I get sad because well,...fewer and fewer of us are one of a kind. I feel like so many of us, including me at times, are trying to fit in and so we end up making choices that aren't wholly our own. We're back in middle school trying our best to win friends and attention. To do so, we'll buy anything and be anyone... except ourselves. It's okay to like cliche things and trends so long as you really like them. For example, I'm going to rationalize that it's okay for me to still want gold metallic accents in my home office, because I truly want them. (Though if I'm being honest, the more popular it becomes, I start to regret the gold accents I've already purchased. )But do I always draw that line? I don't think so. I've found myself jumping on a bandwagon just for the company...for the approval. I'm guilty, and I'm willing to bet that you probably are too. But you know, I want to be original. I have a deep desire to be the person I am instead of sometimes pretending that I'm something different. What I'm trying to say I guess is that we're all supposed to be individuals and that's ok. I'm sarcastic and sometimes a little rude. I can drive a hard bargain and I never let someone walk all over me. I will hold a grudge a lot longer than I care to admit, and while I am slow to forgive, I often love much harder once the deed is done. I am crass and sometimes crude, but I am loyal and kind. There is no one else quite like me. For that reason, I refuse to waste my time from here on doing or liking the same things merely because that's the current trend...even if I have a blog. Our blogs can be -- and should be -- just as original as we are! I'm bucking the system and starting a trend towards originality! Who's with me!? That's how I feel about my "hipster glasses"! I've been wearing glasses since the 4th grade and people still ask me if they're "real" which I think by that they mean "prescription", but I always retort back with "no, they're a hologram!" I'm SO not a fan of chevron. I was shopping for my capsule wardrobe over the weekend and it was everywhere and I was so sad. Anyway, I like owls and I don't like PSL's and I totally am with you on being original! Power to the original people! hahah I will cry tears if I see anymore chevron anything too. I love being original. Yes there are trends I love but there are many I wont even consider and I most def am not one to follow something just because it is in! Yes. I don't like Fall, pumpkin anything, chevron - eh. I find myself going back to blogs that are more "original"... that doesn't mean they can't like what's popular, but you can tell when someone is liking it just because that's the thing now - if that makes sense? I like to hear about what makes a person unique! When I shop, if I happen to pick up something trendy, I always analyze whether I'll still like it when the trend is gone. I make the occasional mistake (cough - platform wedges), but for the most part I wear things I like regardless of how long gone the trend is. Maybe it's because I'm a bit less involved in the blogging and social media community, but I don't feel like originality is dying. I think it's hard to be truly original in a world with billions of people, but I know plenty of people who aren't afraid to chase their own passions regardless of trends and the likes and dislikes of those closest to them. The only problem with blogging is that the whole point of writing is to interest readers, so while you can express originality, you do have to take other people's interests into account when posting or not care about your numbers. So there's a fine line in there somewhere. I love this post! I agree with you about blogging starting to lack originality. There are so many blogs I have read throughout years, and some of them are losing their voices -- they're all starting to mesh together. I like to think of myself as original. I do wear hipster glasses, but I'm pretty eclectic. My house is a random assortment of furniture and trinkets that I've collected throughout the years -- so I guess I win some originality points with that! I love this post! I definitely think a lot of lifestyle blogging has turned into a bunch of us all "loving" the same things, and writing the same kinds of posts. I like to think that I keep my blog different, at least in terms of post topics (ie: not fashion or religion or beauty or anything like that) mostly because I don't feel comfortable just talking about my everyday life. But I know there are things I do because "that's what bloggers do" - like incorporating certain design elements into my blog design. Our blogs are supposed to be an extension of who WE are, and I want to make sure to keep that in mind with everything I do on here. I don't own a single chevron item or statement necklace because they look ridiculous on me. I use a reusable traveler's mug every weekday because I like it and I love not paying $4 every day for a single coffee. I do like everything pumpkin flavored, but I always have. Yay originality! This is a great post! And I agree with you, sometimes it's too much. I mean, how many boot shots can you take? I love boots, but one is enough for me. And scarves. I'm just not into them at all and don't really see their appeal. They can be really cute, but no thank you! I don't mind chevron in small doses, but I mean small. I'm just not there. I wasn't a sorority girl, so I don't get the appeal. So right. There are certain trends I find myself jotting down on my to-buy list and I'll actually stop myself and have this weird little conversation in my head. Hunter boots? Bar carts? Posts on this topic or that? I'm glad that most of the time I'm able to stop myself from taking the plunge by just forcing myself to think, "Do I *really* even want this?" Sometimes yes, sometimes no. You are so right that we are all meant to be unique and original, but I beg to differ on the first part on the post. As soon as I saw the title I was like, "but wait... she IS original!" You are already YOU and there is only one you, whether you like the same popular stuff as everyone else or not. You are actually one of the most unique bloggers I know, which is why I follow you. I think everyone is already different; I think the problem is that we need to EMBRACE our differences, show them off, instead of hide them. I also think that unique-ness runs deeper than the clothes we wear and the Instagrams we take. I think you are original because of your personality -- you and Adam seem so goofy and quirky and fun, but also opinionated and very smart. That is SO hard to find in the blogging world, or anywhere. So if I were you, I wouldn't worry about it... and everyone else who is trying to conform, that will only get them so far in life :) xo! You are so right here. I try everyday to make sure my blog reflects me / my voice. And reusable mugs? YES PLEASE! My hubby and I make a big pot of coffee every morning to divvy between our two mugs. Sometimes, if I'm in the mood for a frappe-like I throw the coffee in the blender and make my own creation! I hate Tory Burch flats. I think people are ridiculous to pay that much for shoes that aren't even comfortable in the least bit. Every time I see a girl walking in them, I want to cry for her poor, sore feet! I only blog about things that I like, I will never like someone just because everyone else does....but I have noticed that we all tend to like a lot of the same things! I also tend to not be very filtered with my choice of words, and I am sarcastic and snarky at times haha. I just do what I like and don't do what I don't like. For instance, I don't like gold. So I don't do #allgoldeverything. I think it depends on which blogs you read and which you don't. There are always the excessively stubborn individuals who really, really insist on individuality...like I don't drink coffee, I never shop at Target, I don't wear infinity scarves or maxi dresses. And I'll do stuff like move to China (if that became a trend that everyone started following I would be shocked beyond belief). AMEN!!!! Although I do love my bar cart! ;) I like what I like and don't jump on the bandwagon if I don't like it for the sheer sake of fitting in. My biggest pet peeve is the Starbucks cup too. Is your photo not legit if there isn't a Starbucks something or other drink in there? It's like the most common prop now. To each their own though. You keep doing you, and I'll keep doing me. Thanks for a great post! I find myself feeling this way all the time with blogging. I start seeing what other people are posting and what is/isn't working for them or how often they post, or what types of posts, and then I find myself slowly doing the same thing and then I have to stop and refigure out what my blog is supposed to be about, MY journey, not anyone else's. I love this post. It is so well written and so spot on. I often feel like an outsider because I don't typically like or follow the same things as everyone else. I don't keep up with trendy things because it's too time consuming and I don't care enough and my home is my home and it's going to look how I want it to, Pinterest be damned. I have my style, my tastes and I am happy with them. 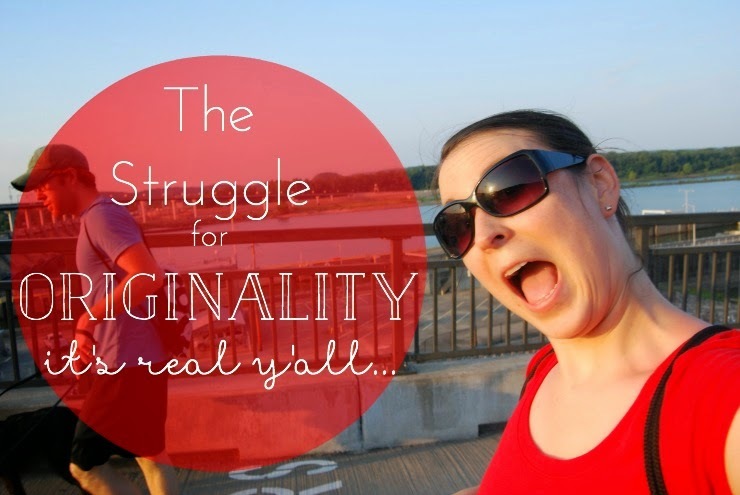 I think social media has made it hard to be completely original because of the whole wanting to fit in thing. It makes sense and I get it but I wish people wouldn't feel so much pressure. Being original is better. You won me over with a shared hate of Chevron. And even worse… when people do a whole nursery in matching chevron print. Curtains, crib guard, pillows all included. !!!! Individuality and originality is what makes life so interesting - we should all embrace what makes us unique and celebrate each other for it!! I want to HUG you! This whole week I've felt this struggle! For example- there are so many linkups that are fun to join... but then there are more and more and more and before I know it, my entire week of blogging has been planned out by the prompts of whatever the linkups are and I'm just like- what am I doing?? I'm taking this weekend to regroup and get back to what I'm feeling inspired by. (And sometimes I think this is natural... we have to go through the whole "reset" thing.) THANK YOU for this post! I took it as kind of a confirmation that yes- I just need to "do me." I totally, TOTALLY feel you on this!! I've been trying to put together the words to write a post about it, but I feel like you put it so well, without judgement. I confess that I can't stand Diet Coke or the Bachelor or flower crowns - and there have been times where I've really wondered if I need to jump on those bandwagons to be like other bloggers. NO! :) Thanks for being real. I agree. We all need to be shine as individuals having our blogs reflects who we truly are not what is trendy. Otherwise what is the point of it. Reading "the same blog" over and over is so tedious. We are supposed to be blogging to have our voices heard not to be an echo of someone else's.